What would it mean to your music career if Facebook suddenly shut down? Do you have another streaming platform available if SoundCloud decided to close your account? Would your fans be able to find you elsewhere on the web? Those types of questions can produce a ton of anxiety for musicians. In the last year, we’ve been reminded more than a few times of the importance of owning your data and online presence. In early 2016, Facebook significantly changed its algorithm for displaying content on pages. This required page owners to spend money in order to share posted content with their audience. Musicians who worked for years to grow a Facebook following lost their point of contact with fans seemingly overnight. In mid 2016, it changed again. Again in late 2016. And well into 2017, Facebook is still constantly tweaking the formula to combat fake news and other content issues. This kind of volatility is not exclusive to Facebook. In the last year alone, SoundCloud has reported major losses, major rebounds , and more losses. Many musicians wonder if the service will survive 2017. Rdio fizzled out, Vine closed its doors, Google+ never found its groove, MySpace had a good run, and Twitter is in trouble. While Bandcamp and Mixcloud appear to be in decent shape, time will tell if they face similar outcomes. Utilizing social media platforms comes with a large number of tradeoffs. In addition to the question of how long the platform will stay alive, you’re also expected to sign off on the Terms of Service. When you create a profile on a hosted platform like Facebook, MySpace, SoundCloud, or Instagram, you must agree to the terms of service before you can open the account. I’ll be honest. At best, I skim the text. I assume it includes legal speak about how any content I create on these platforms can be removed at any time. Several musicians and DJs found out about this the hard way. In 2015, SoundCloud made headlines for suspending tons of user accounts, even when they contained all original music. It doesn’t stop there. A lawyer in the UK translated Instagram’s terms of service into easy to understand language as part of a government task force aimed at helping teenagers understand the implications of using Social Media. The full link is here, but the gist of it is pretty much that Instagram (and we can assume other social medias) can do practically anything they want, and users can’t do anything about it, except choose to leave the service. Also, Instagram reserves the right to remove any Content from the Service for any reason, without prior notice. Content removed from the Service may continue to be stored by Instagram, including, without limitation, in order to comply with certain legal obligations, but may not be retrievable without a valid court order. Company may terminate your access to all or any part of the Service at any time, with or without cause, with or without notice, effective immediately, which may result in the forfeiture and destruction of all information associated with your membership, including, without limitation, any access to any Music you may have purchased through the Service. Even if you’re the one who decides to leave a platform, these types of services make it very difficult to take your data with you. Most content is in a format that is specific to each site, and cannot be easily migrated to another platform. While the futures of online platforms are questionable, the internet as a whole is a pretty stable facet of our culture. That’s why it’s safe to assume that your website will be a reliable, valuable asset for many years to come. That is, if it’s created properly. Services like Squarespace, Wix, and Shopify have made website creation an affordable possibility for millions of people. However, since the website software and hosting is still owned by one company, they suffer many of the same uncertainties and migration obstacles that social media does. Why is WordPress a good choice? WordPress.org has been around since 2003 (making it older than Facebook). While one could argue that it is a platform subject to volatility just like the socials, WordPress has some characteristics that differentiate it. It is open source, which means you can use if for anything you’d like, without paying a fee to license the software. That fact that it’s open source also means that thousands of people and companies (like AudioTheme) are continually making products to expand its capabilities. As of a year ago, ManageWP reported that over 44,000 plugins had been created. WordPress has been translated to more than 56 languages. WordPress.org is a self hosted platform. Entire sites can be migrated to a new host if you desire. If your host goes out of business or fails to earn your loyalty, you can easily move on. Over 26% of websites are now powered by WordPress, including some popular ones like BBC America, Sony Music, and Beyoncé’s website. 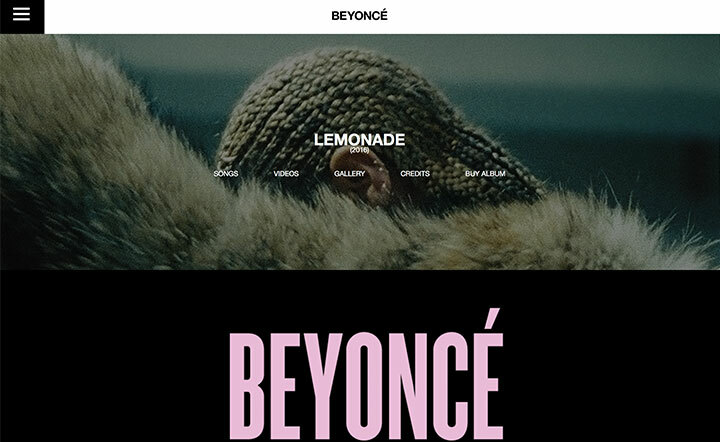 26% of websites use WordPress, including Beyoncè’s. This diversity in contributors and interested parties gives WordPress a strong base and many resources for continued growth. In addition to its staying power, WordPress also has data portability built right in. Users have the ability to change the look and feel of their websites with a single click. Since post and page data is stored in a database, changing a theme allows you to completely transform the look of your site without affecting your content. 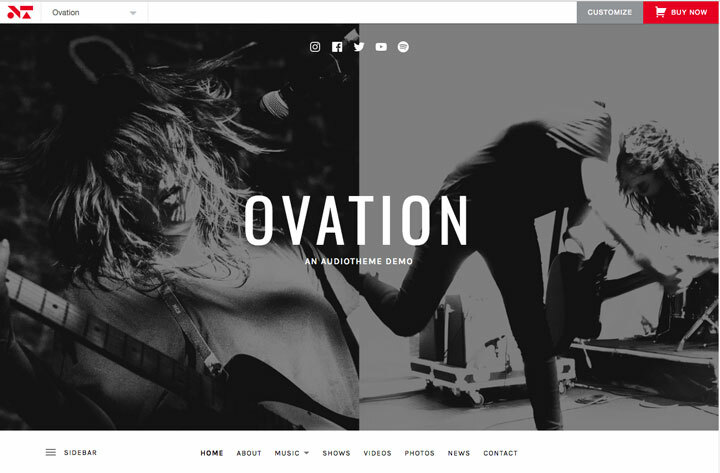 This is a great feature for musicians, who may want to frequently change the design of their site to reflect their latest record or promote a tour. We’re still big fans of social media as a whole. We recognize the benefit it provides bands and musicians in conjunction with a great website and solid mailing list. We advocate a three pronged approach that allows you to stay connected with your fans across the web, while maintaining a firm grasp on your data and online presence. We understand the important of social media, which is why our themes have social menus built-in. Your website should be utilizing the latest technology so that it looks good and functions well on any device. If you purchase one of our premium WordPress themes for musicians, we’ll stay on top of this for you. 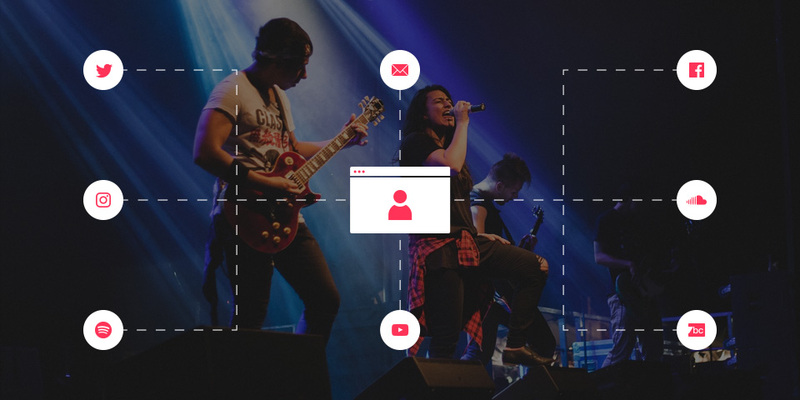 You’ll also want to make sure your site includes must have content and up to date information about your band including streaming music, gigs, and contact information. A necessary, yet often overlooked step is performing regular site backups. Your host may offer these as a bundled service, but there are also third party plugins that can be scheduled to perform periodic backups. BackupBuddy and UpDraft are two of the more popular ones for WordPress. Frequently posting on social media allows you to stay in contact with your audience and provide a level of personality that can strengthen your connection. Some people will check for updates on social platforms first because it is convenient, so take full advantage of the networks’ sizes and use them as supplemental tools. When posting original content like long-form posts, be sure to back these up somewhere else in case of an account suspension, platform closure, or other situations that might not allow you to access your data. Email marketing is one of the easiest ways to get new music, content, and announcements in front of an audience. It also is the one type of content that goes directly to your fans, instead of having them seek out content. Email addresses are also extremely portable, making them a great tool for maintaining your data and online presence. While some newsletter campaign services have come and gone, it is easy to move from one to another. Utilizing these three tools should allow you to maintain a firm grasp on your data and online presence and reach more fans. Track your results and determine what works best for you. But, you can rest assured that if a specific social media platform disappears or makes other changes, your audience will still be able to find you online.